Aren’t black beans just the best?? They are so yummy, in all sorts of dishes. 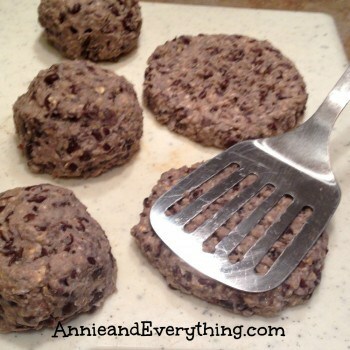 But my favorite way to use them is in Pioneer Woman’s Black Bean Burger Recipe. They are SO GOOD — even the kids clamor for them! 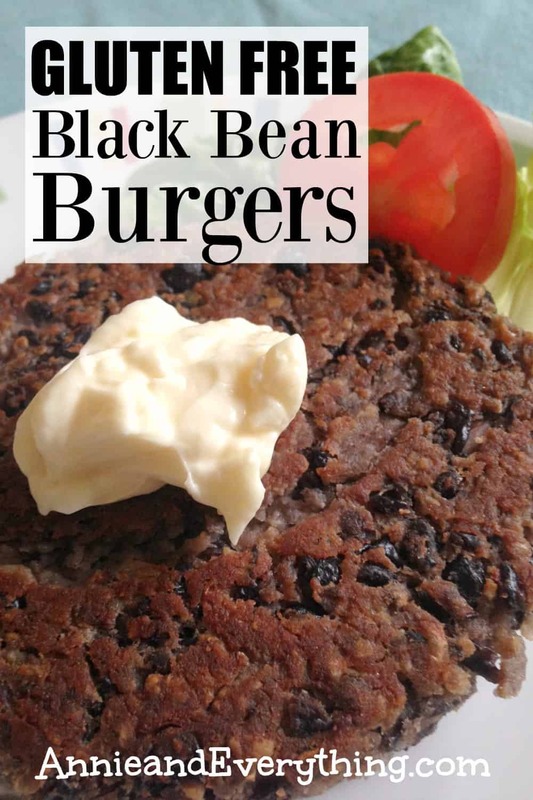 There’s only one problem with her black bean burger recipe, and that is that it is not gluten free. Sometimes when you try to convert non-gluten-free stuff to gluten free, it doesn’t taste so good. 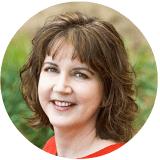 But I’ve found that there is an easy substitution for recipes like this — the ones that don’t involve baked goods or breads or things that must rise in the oven. I use this same substitution for meatloaf and meatballs. Here’s my super-dooper substitution: replace bread crumbs with gluten free oats. I buy Bob’s Red Mill Gluten Free Quick Oats. The quick oats are cut small enough that they are very similar in texture to bread crumbs. They absorb moisture easily and provide the filler that you need for this type of recipe. 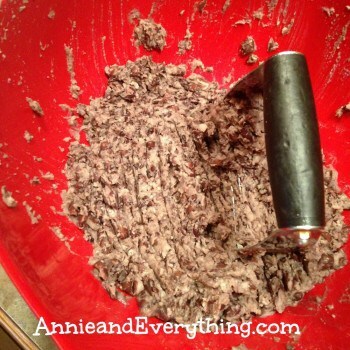 You can substitute the oats 1:1 for the breadcrumbs, which means in this recipe that instead of using 1 cup breadcrumbs, you can use 1 cup gluten free oats. 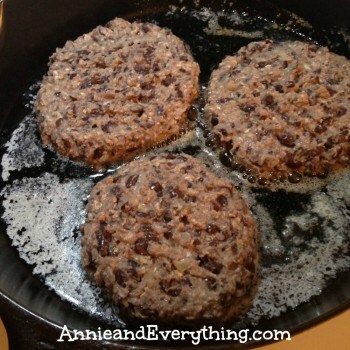 Since the original black bean burger recipe calls for seasoned bread crumbs, though, I also add some garlic powder, a tablespoon or so of oregano, and maybe a little paprika, all of which help to make up for the lack of flavor in the oats. Her recipe is really easy and quick. My kids LOVE IT. So we make it A LOT. First you mash 2 cans of drained (but not rinsed) black beans in a bowl. Then you add 1 cup oats, 1/4 c. grated or chopped onion, an egg, 1/2 tsp chili powder, 1/2 -1 tsp garlic powder, 1/2 – 1 TABLESPOON oregano, a sprinkle or two of paprika, and a dash or two of hot pepper sauce. 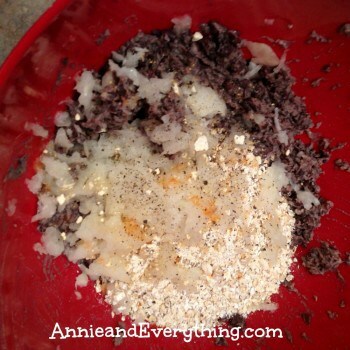 Mix it all together and form it into patties. I always do that the way my father did it: make balls and then squash ’em flat with a spatula. Fry them over medium heat in a mix of olive oil and butter about 5 minutes per side. The kids like them with cheese and bread (or a bun), but I’ve made them gluten-free for a reason, lol, so I eat them straight off the plate with a fork and knife. Mmmmmm! 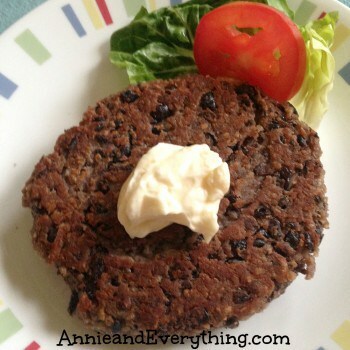 This black bean burger recipe is cheap, easy, and yummy — the three criteria by which I judge a recipe, lol. And now you can have them gluten free! How cool is that?